In this first step of our multi-phase selection process, medical professionals are invited to nominate the top doctors in their area. Each nomination carries a point value. Who is entitled to nominate? Medical professionals in your area who are licensed and active physicians with a "Doctor of Medicine" degree (MD) or a "Doctor of Osteopathic Medicine" degree (DO). Licensed and active Oral & Maxillofacial Surgeons practicing in Southern California and in the NYC-Metro area are also eligible. I do not have an access code. How can I get one? Invitations to nominate (containing the access code) are sent to medical professionals. If you lost, misplaced or did not receive your invitation, click here to request an access code via e-mail. May I nominate via paper ballot? Yes. Click on this link. Print and fax to the number on the ballot. Can you confirm that you received my ballot? If you completed your ballot online and provided us with your e-mail address, you will receive confirmation by e-mail. We are unable to confirm receipt of paper ballots. I have an uncommon medical specialty. I'm afraid I'll be overlooked in the balloting. What can I do? Our research team evaluates candidates on 10 indicators of peer recognition and professional achievement. They find this information by looking at bios on hospital and clinic Web sites. If your Web site bio is not current and complete, you may update the information here at my.superdoctors.com. I want to know who nominated me. Will you tell me? No. We maintain strict confidentiality over the balloting process. If I am notified that I have been selected, is there anything I need to do? Yes! Please complete the data verification process. This verifies your current contact and professional information and ensures the accuracy of what we publish. I was listed in Super Doctors last year but not this year. What happened? We perform a new round of balloting and blue ribbon panel review each year, so the list undergoes some degree of change from year to year. Being listed one year does not guarantee that you will be published the following year. May I nominate doctors from outside my area? Our formal nomination page is designed to accept nominations only from medical professionals within your area. However, once logged-in to our online profile management system, you may click on the Comment on/Evaluate tab at the top of your dashboard page, and you'll be invited to provide feedback on doctors on this year's list or doctors from other areas. 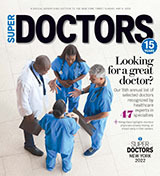 Login to my.superdoctors.com to make your nominations online. If you are unable to nominate online, you may download a PDF ballot. Print and fax to the number on the ballot.